The newswires were inundated with Hadoop-related products announcements this week, and next week will be even crazier. Some are interesting, some are less interesting, but they all underscore the trend we’ve been seeing shape up for a couple years now: Big data, and Hadoop specifically, is the new cloud computing. Not in functionality, of course, but in strategic importance — if you’re an IT vendor and you don’t have a Hadoop story, you’re not trying. Anyhow, here are some of the week’s Hadoop highlights. If I missed anything important, feel free mention it in the comments. Hortonworks Data Platform 2.0, powered by YARN: This was a long time coming, but Hortonworks was able to pull the trigger after Hadoop 2 was blessed as stable last week. The biggest deal is Apache YARN, the resource-management layer that lets a single Hadoop cluster run multiple processing frameworks beyond MapReduce. Hortonworks is already working on enterprise-grade stream processing with Storm. 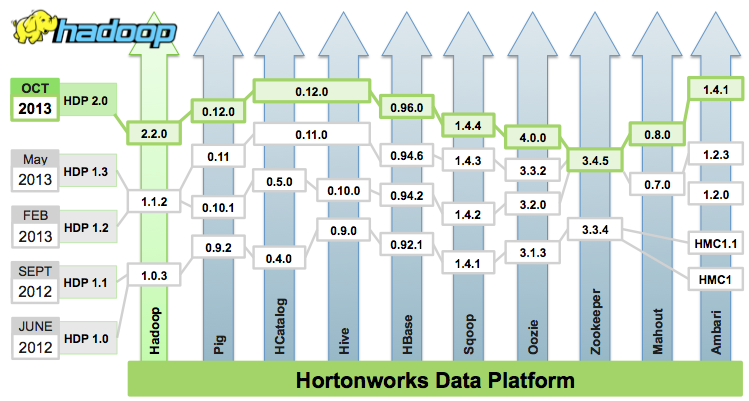 The evolution of the Hortonworks Data Platform. Are you a cloud provider? Then you must have a Hadoop partner: Savvis and Virtustream both announced partnerships with Hadoop vendors this week — Savvis with Cloudera and MapR, and Virtustream with Intel. We’ll see even more of these announcements next week, and from some big names. Of course, Amazon Web Services, Joyent and IBM already have their own services. The era of managed Hadoop is upon us. 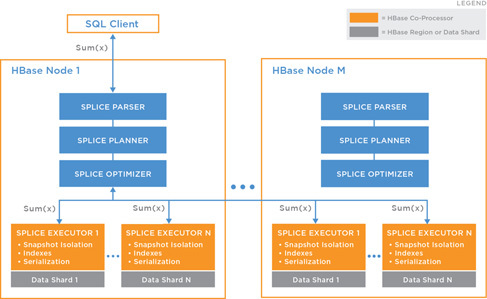 Splice Machine SQL-on-Hadoop database is available to some: Speaking of SQL on Hadoop, the Splice Machine relational Hadoop database is now in “limited release,” which means the company is looking for 50 evaluators to test it out, give feedback and the like. Unlike most SQL-on-Hadoop plays, though, Splice Machine is positioning itself as a transactional database rather than as an analytic database. EMC/VMware spinoff Pivotal does OLTP on Hadoop: Pivotal is picking up its Hadoop development after unveiling its HAWQ SQL-on-Hadoop strategy earlier in the year. The company has integrated its GemFire XD in-memory database with HDFS to create a transactional database that has access to data stored in Hadoop. It also released a product called data dispatch (in association with the New York Stock Exchange) that lets analysts see a consolidated view of various internal and external datasets. The whole Pivotal data stack. Skytree connects its machine learning software to Hadoop: This is kind of a no-brainer and was part of the plan since Skytree’s launch — as one of the first companies really pushing the idea of machine learning on big data — and now it has finally happened. Machine learning, in particular, has been one workload for which Hadoop hasn’t traditionally been ideally suited, so this should be welcome news for some users. 0xdata’s predictive analytic service is now better: 0xdata (pronounced hexadata), is a startup we’ve been covering since its inception in 2012, and on Thursday the second generation of its predictive analytics service became publicly available. It’s essentially a very fast way to work on data stored in Hadoop via widely used analytics tools like R and Excel. The company has a number of big users already, including Netflix. Platfora’s new release has some pretty sweet features: Platfora took the wraps off its analytic software for Hadoop last October, and this year it added a whole lot of new capabilities. Among them is a feature called event-stream analysis that lets users view, for example, different behaviors across various points in a multi-step process. Platfora CEO Ben Werther says this is much more than standard aggregated BI analysis most SQL-on-Hadoop products are offering. “Slapping Tableau on a SQL interface gets you pretty pictures and that’s about it,” he said. 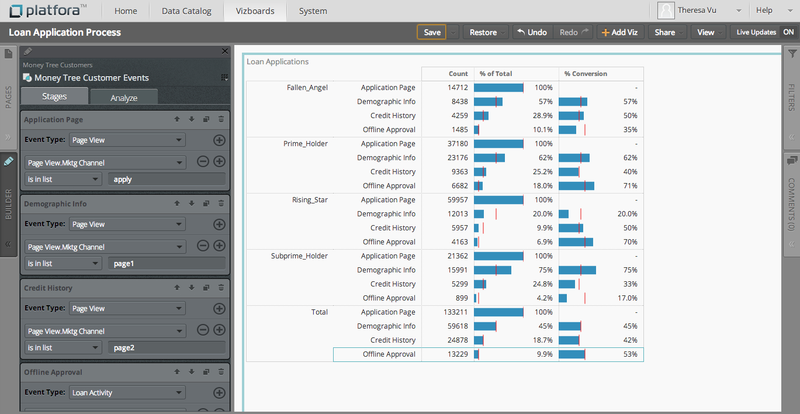 Event-stream analysis for a loan application. Feature image courtesy of Shutterstock user Johan Swanepoel.